The April issue of the Bulletin has been published and is available. 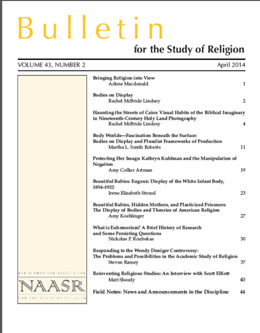 Below is the table of contents of this issue, which includes a set of papers on the topic of “Bodies on Display”. After Rachel McBride Lindsey’s introduction the this set of papers, where she sets forth the theme of bodies as sites for religious discourse, we have four fascinating papers by Rachel Lindsey, Marthat Smith Roberts, Amy Artman, and Irene Elizabeth Stroud. Amy Koehlinger’s extends the discussion with an engaging response. This issue of the Bulletin also includes papers by Nickolas Roubekas on Euhemerism, Steven Ramey on the recent controversy over Wendy Doniger’s The Hindus: An Alternative History (Penguin, 2009), and an interview by Matt Sheedy with Scott Elliott on Reinventing Religious Studies: Key Writings in the History of a Discipline (Acumen, 2013). As always, we welcome submissions for future issues – including responses to published articles – from established scholars and graduate students engaged in the study of religion (regardless of discipline) for either publication in the Bulletin or for here on the Bulletin‘s Blog. Our guidelines for the journal are available online. This entry was posted in Announcements, Matt Sheedy, Religion and Popular Culture, Religion and Society, Religion and Theory, Religion in the News, Steven Ramey, Theory and Method, Theory in the Real World and tagged american religion, Amy Collier Artman, Amy Koehlinger, Arlene Macdonald, baby contests, Biblical Imagery, Bodies, Body Worlds, Bulletin for the Study of Religion, eugenics, Euhemerism, Field notes, Hinduism, Irene Elizabeth Stroud, Kathryn Kuhlman, Martha L. Smith Roberts, Nickolas Roubekas, Rachel McBride Lindsey, Religion, religious studies, Scott Elliott, Wendy Doniger. Bookmark the permalink.